A year ago today, Corbet and I learned that our first child, at 12 weeks of gestation, had passed away. The weeks following were a nightmare due to medical complications, poor hospital care, and the usual grief that goes along with such a loss. We mourned our little one, but we recovered, stronger and closer than ever, ready to keep on playing the game. Now that I’m 31.5 weeks along in my second pregnancy, and now that the arrival of this sweet little bundle is becoming a reality, I feel comfortable writing about some of the things I’ve experienced during this pregnancy that I couldn’t have foreseen before, or even after, our miscarriage. 1. Though we might imagine that our friends would be able to sympathize with the loss of a baby, even if they themselves have not lost a baby, the truth is that, friends or not, people can be cruel. A few months after the miscarriage, someone that I considered a good friend at the time told me that I couldn’t claim to be pregnant unless I’d been pregnant for 3 trimesters. That person has since drifted out of my life, and I struggle with forgiveness. When I think back on that moment, my heart still hurts. Our baby was real, and our love for him/her was growing daily. We were parents, if only for a short time, and I don’t understand why someone would want to take that away from us. 2. Amazing people have come out of the woodwork. Fortunately for Corbet and I, the story above was an exception. By and large, people were kind, supportive and loving, even those we didn’t know well at the time. Through that experience, we’ve gained some friends that I hope will remain in our lives for a long time. 3. Throughout my subsequent (and current) pregnancy, I have struggled with a balancing act between optimism and memories of the only pregnancy story I’ve experienced. It has been very difficult for me to assume the best. The weeks between prenatal appointments have been long and trying, and I’ve often given in to the fear instilled in me by my first pregnancy. I knew this would happen, to a degree, but I didn’t anticipate quite how difficult it would be. The experience of having your child die inside of you without your knowledge makes it difficult to fully rejoice in a new pregnancy. However, now that my son is moving (at least) hourly, I find it much easier to relax and enjoy the pleasure of his existence. 4. As I near the arrival of our sweet boy, I realize that for much of this pregnancy I haven’t really believed there was going to be a happy ending. It saddens me to know that I’ve spent so long preventing myself from truly celebrating, but as I move into a place of hope and optimism, I forgive myself for those months of disbelief. 5. I can’t wait to continue the journey with this new little person. I can’t wait to hold him, to look into his eyes, to know him, to see who he becomes, and to do all of that side by side with my very best friend. Up to 25% of all pregnancies end in miscarriage. 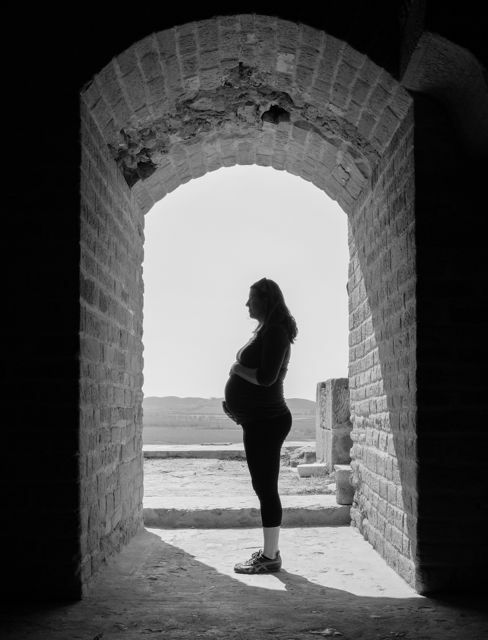 Before I had a miscarriage of my own, I assumed, along with many other women, perhaps, that a healthy pregnancy was my right and a given, instead of the miracle and gift that it actually is. Through my experiences I’ve become much more sensitive to how I speak about pregnancy around and with other women. We never know who is listening and what painful journey they’ve been on. Why don’t we just err on the side of kindness and sympathy? We might be able to spare someone a lot of pain. Hey Angela and Corbet, I too lost a little one early on in a pregnancy – I always like to think that it was the little girl I never had… For those stupid people that dont believe it is a ‘real’ pregnancy, here is an article that proves that it is – even if a baby is aborted or miscarried. An amazing article I think you will enjoy reading. This article shows how this little one is now part of YOUR DNA, Angela, and always will. Thank you for sharing, Juanita! That is a great article. I appreciate that you took the time to read my post. Writing it was truly therapeutic, and I hope my thoughts can help someone else on their journey. I have been enjoying the posts both of you have contributed. Keep it coming. Laying out your thoughts in the well written fashion that you both manifest has given me an insight into your inner workings and has caused me to reflect upon myself as well. We look forward to meeting Dorian this summer…,I know Hunter is. It will be nice to have a hybrid cousin his age to romp around with…,baby romping that is. Thanks Josh. We appreciate you taking the time to read. It’s important to me that my family really know who I am, and that I know who you are. You’re a good brother. I hope our kids become buddies.